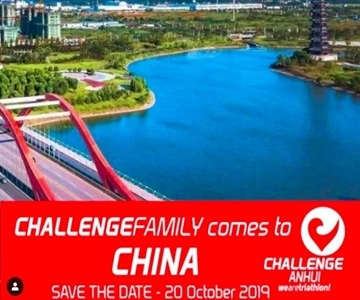 The first ever CHALLENGE FAMILY race in mainland China will take place on October 20, 2019 in the province of Anhui. Located in an area for international cultural tourism and with a spectacular scenery of mountain ridges and lakes, CHALLENGE ANHUI offers perfect conditions for athletes from all over the world. The swim will be held in the scenic urban river followed by a bike course ride, rich in variety in the south of Anhui. A super flat run course in downtown Anhui will round off the race, where participants will be greeted with the unique experience and vibe of live performances and an enthusiastic audience waiting to cheer everybody home. “We are excited to welcome the participants to Anhui for an unforgettable event. Athletes will be treated to a stunning course with incredible scenery in South Anhui. CHALLENGE ANHUI is the first and only international triathlon event in mainland China and it is a privilege to join the worldwide series of CHALLENGE FAMILY events", says Hanju Yu, Race Director of CHALLENGE ANHUI about the newest addition to the CHALLENGE FAMILY. For more information about go to the CHALLENGE ANHUI Website.